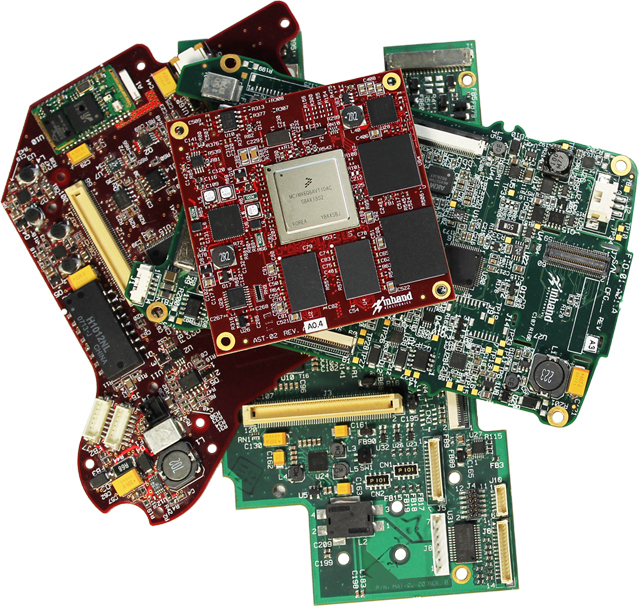 Modified COTS: using InHand’s SBC platforms as a starting point, validated schematics, circuit board artwork, and operating system source code is modified to enable application-specific features and optimize cost. As compared to fully custom designs, modified COTS accelerate schedules from kickoff to production while reducing cost and risk. Custom designs: when requirements dictate a fully-custom design, InHand leverages its broad portfolio of circuit, OS, and device expertise to deliver. Using the same proven development process as modified COTS, InHand typically delivers initial prototypes designed to industrial and military spec within the same 3-4 month window at reasonable cost. Our mechanical engineering group has years of experience integrating our hardware into packages that meet our customer’s specific requirements. Close relationships with outside vendors who provide rapid prototyping, machining, and injection molding help to accelerate the design cycle and get products to market. InHand is Solidworks Certified ProfessionalOur versatility allows us to operate independently or as a natural extension to your design team. Our primary tool is SolidWorks a powerful and efficient 3D solid modeling software package combined with Finite Element Analysis (FEA), photo-realistic rendering, and remote design collaboration software. Files created in SolidWorks can be exported to a number of different formats to launch downstream documentation, prototyping, and production. For those customers who already have an in-house mechanical engineering capability, we offer complete computer files for our board-level platforms. The board assemblies are typically provided in IGES or DXF formats, however, other formats are available upon request. These files will allow our boards to be easily dropped into your design without spending precious redrawing time.